Samsung is launching ChatON, a cross-platform mobile chat service similar to RIM’s BlackBerry BBM. The service, which is expected to launch in September, will be showcased at this week’s consumer electronics-focused IFA Conference. is an interesting launch for Samsung because it will support a variety of mobile operating systems, including Samsung’s own bada mobile operating system, Android, feature phones and even competitors’ platforms, including iOS and BlackBerry. In addition to supporting mobile chat, ChatON will offer a Web-based client that allows users to chat from their PCs, too. The service’s users can have private 1-to 1-conversations or participate in group chats. ChatOn also supports sharing media, like photos, videos, voice messages and contacts. On feature phones, the service allows for text, images, calendar appointment and contact sharing. But on smartphones, users will have a few extra options, such as the ability to comment on each other’s profiles, send multimedia messages that combine text and audio, and view their own “Interaction Rank,” which displays how active they are on the ChatOn network. 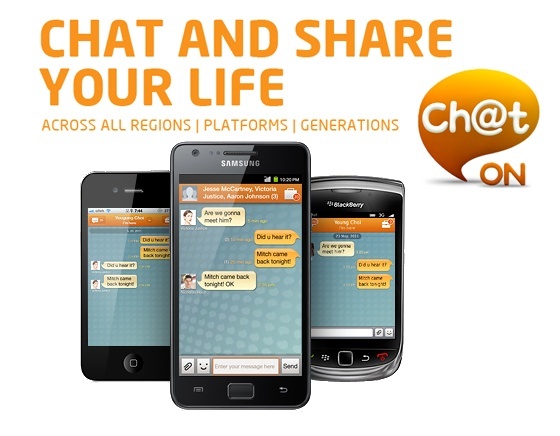 ChatON will go live next month in over 120 countries and 62 languages. 0 Respones to "Samsung Launch ChatON Platform Mobile Chat Service"